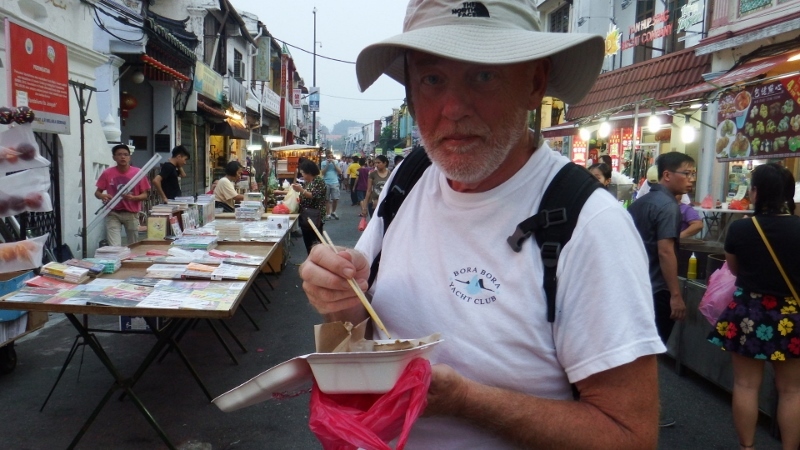 During October we have made our way around the Malaysian peninsular for the last time. 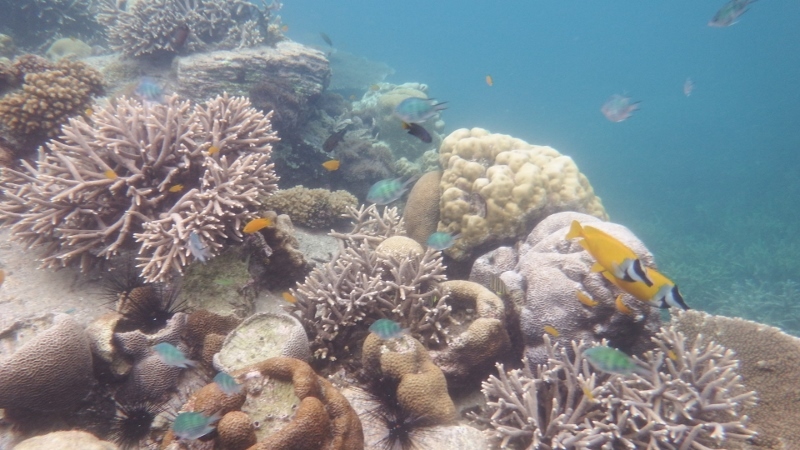 After Kate and co had left Tioman on 1st October Bill inadvertently managed to check us out. Not normally trusted with the paperwork he decided on this occasion he would ‘help’ as I was busy chatting to Kate. 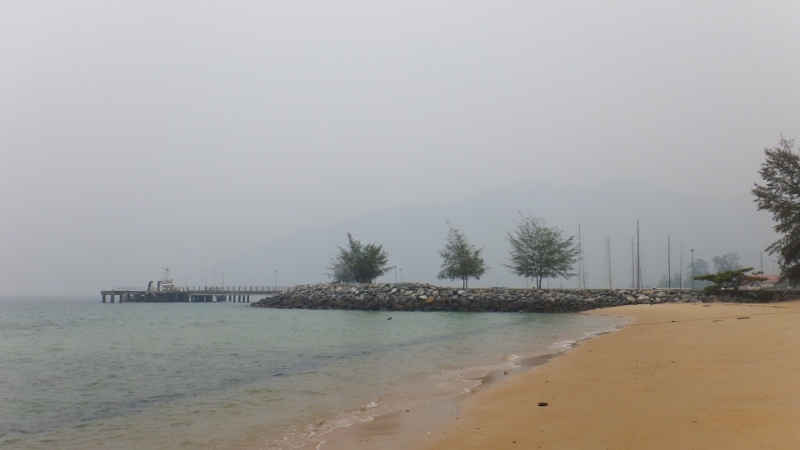 Originally we were going to stay in Tioman for a few days but after completing the paperwork and coming across an unusually officious customs officer who stated if we didn’t go he would take our paperwork back, we decided to leave. The weather was still very smoggy. There’s a really nice walk over the island from the back of the resort for any one who comes here so on the 5th the six of us did that. Hot but fun. Forgot camera. 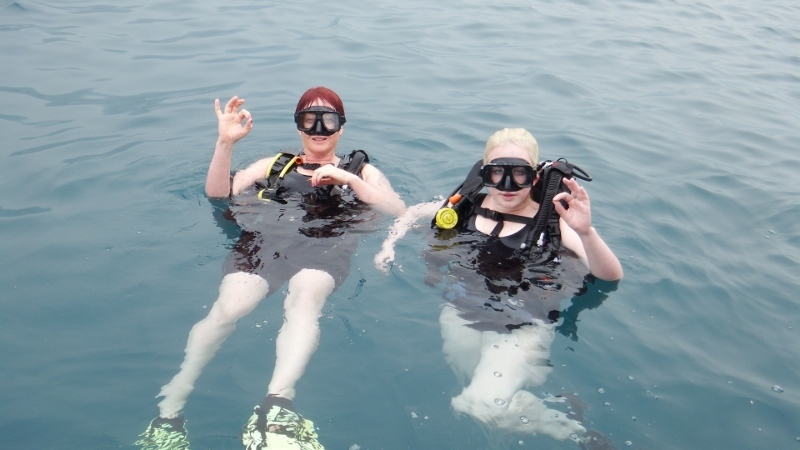 When we got back Bill and I jumped into the water for a snorkel. It was our last on this coast and the last of the summer. That evening we had a pot luck supper on Inspiration Lady with Tasha followed by a game of Mexican trains, sort of dominoes game, oh and quite a lot of alcohol! It was also the last we were going to see of Marilyn and Des on Tasha – probably – but you never know. The next morning Bill and Gary paid a visit to the fuel barge in the dinghies to pick up some diesel in jerry cans. At MYR1.85 a litre (about 30p) it was a bargain. 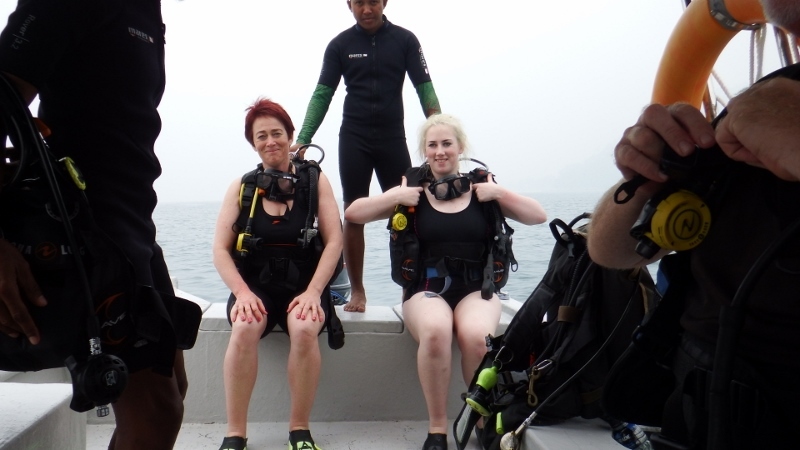 We noticed that the smog had lifted and the visibility wasn’t bad so decided to make our passage around the bottom of Singapore. 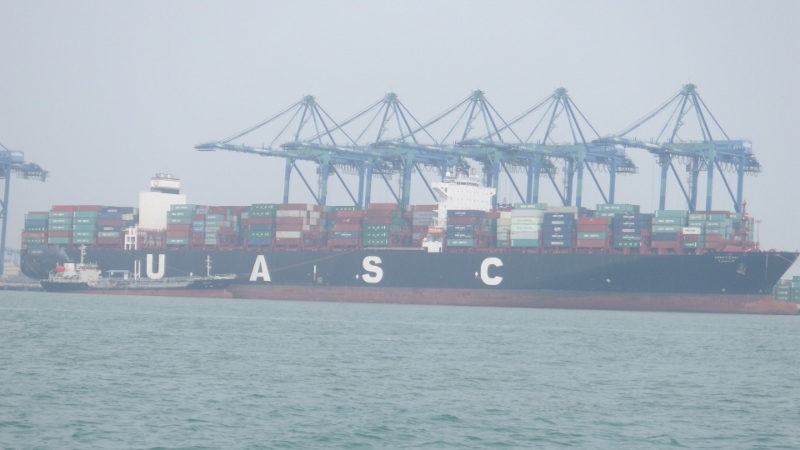 Even though we kept out of the shipping lanes the ships coming in and out of Singapore came very close. We were lucky to have the tide with us and were soon traveling passed the wonderful downtown area with all the big skyscrapers and the magnificent Marina Bay Sands hotel. You just make them out in the murk and this was the best visibility we had had in days. 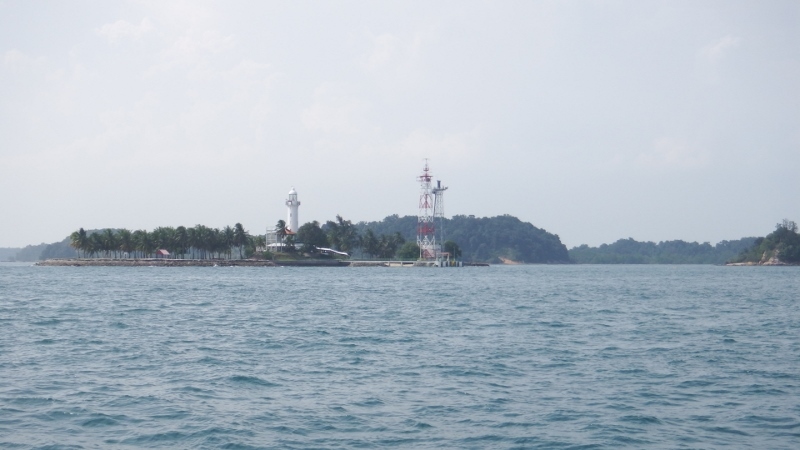 we rounded the Raffles lighthouse on the southern tip of Singapore. 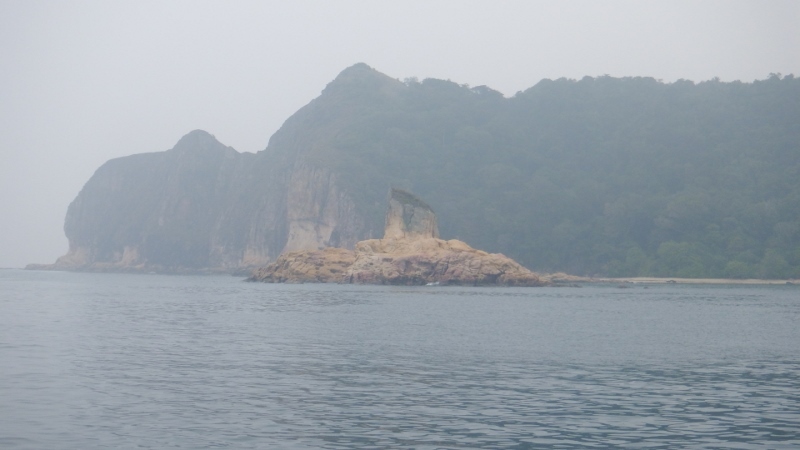 This was as far south as we go in Asia. The next time we are at this latitude will be in the Maldives next year. 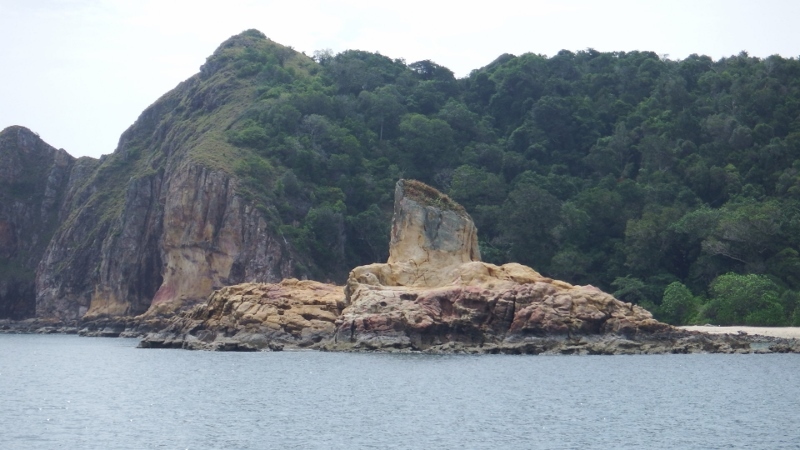 We turned north west towards the Johor Straits. 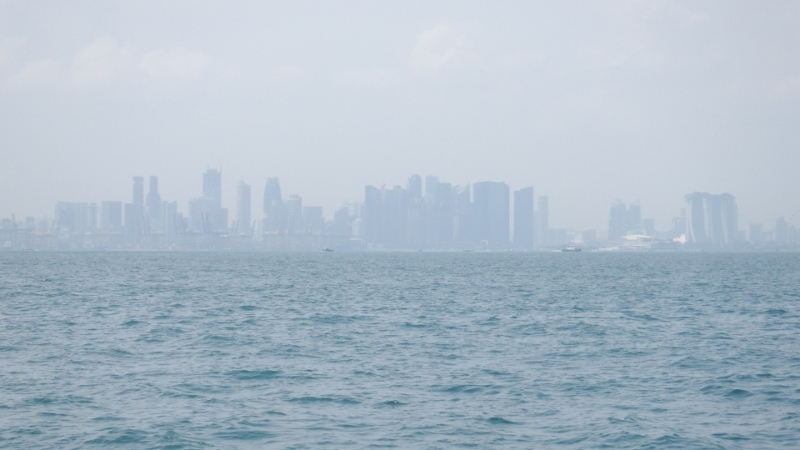 The Johor Straits are on the Indonesian side of Singapore and the smog returned but at least we had managed the Singapore straits in reasonably good visibility. This is a strange looking ship. 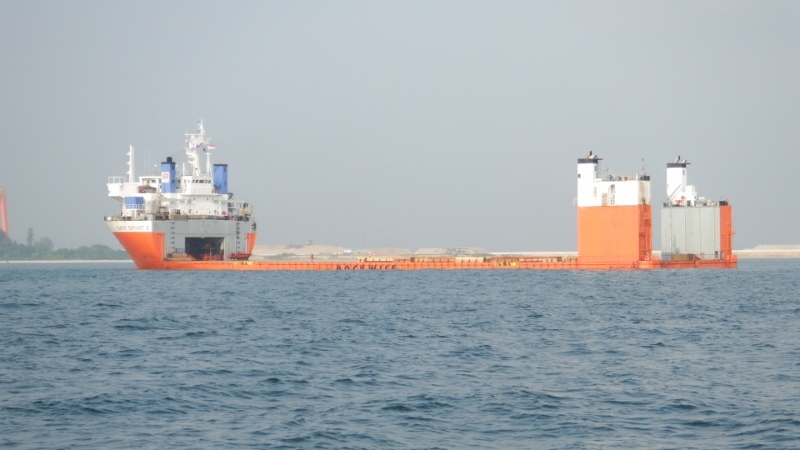 It’s one of the Dockwise ones that carries other boats. 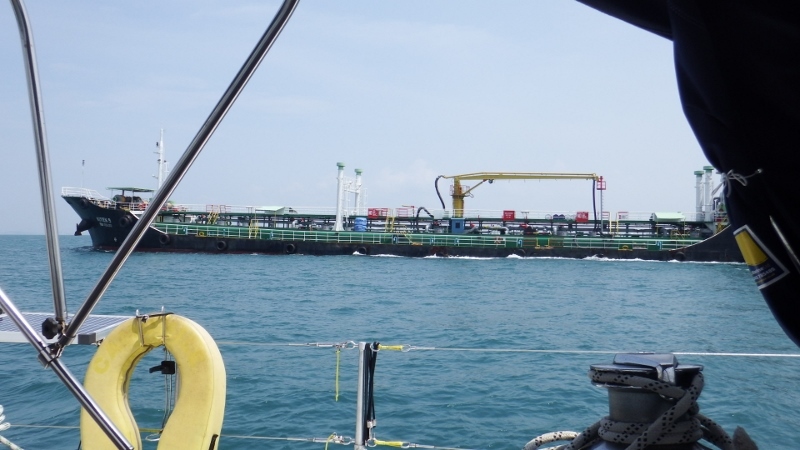 We carried up the Johor Straits and arrived at Puteri harbour marina at 19.30 where we stayed for 8 days. 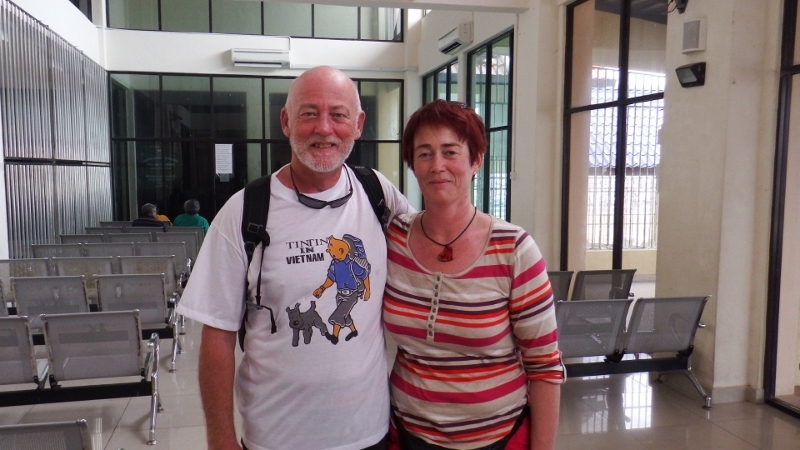 While we were there I got on with the washing and shopping and writing blogs. 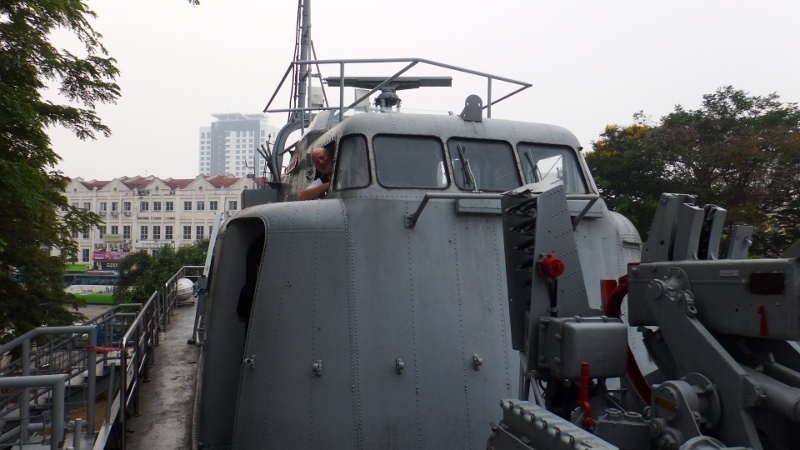 Bill managed to wash the last of the yellow stain from the Terengganu river off the hull then wax polished it. 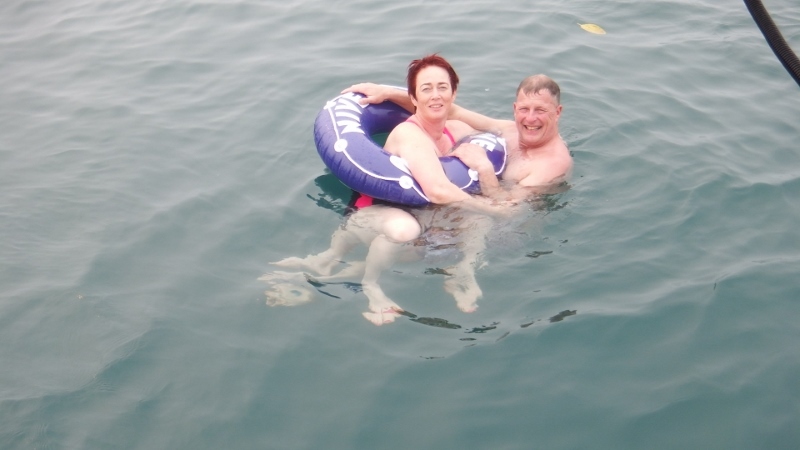 Bill went to Singapore for the day with Gary and Jackie but I stayed on the boat because they were only shopping for boat bits and treated myself to a morning in the hotel spa for a gym session, steam room, swim and a wonderful long shower. The thread on the jerry can covers has disintegrated in the sun so I got the sewing machine out and re-sewed them all. On our last evening we went onto Inspiration Lady for drinks and a game of cards because we probably won’t see them until Christmas now. 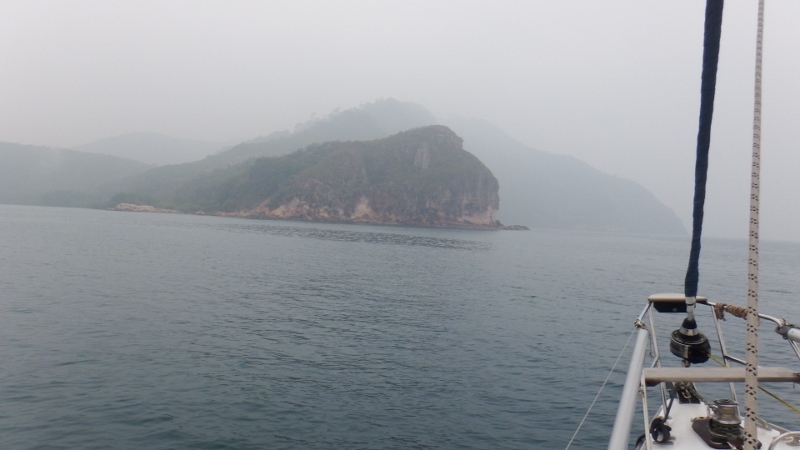 The next morning we rounded the south east tip of Malaysia for the last time and headed north. We worked out we’ve made the journey up and down the Malacca Straits 5 times in the last 2 years but this will be our last. From this point on we are on our way home – although it will still take us a few years. 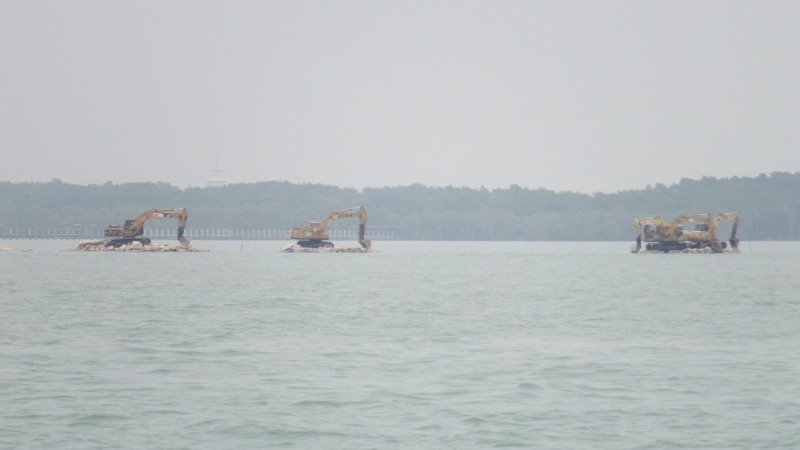 There’s a land reclaimation project happening down here but at high tide the diggers sit on little plots of land and looked very funny with the water surrounding them. Admiral marina is a lovely place to stay with a bar, gym and lovely swimming pool. 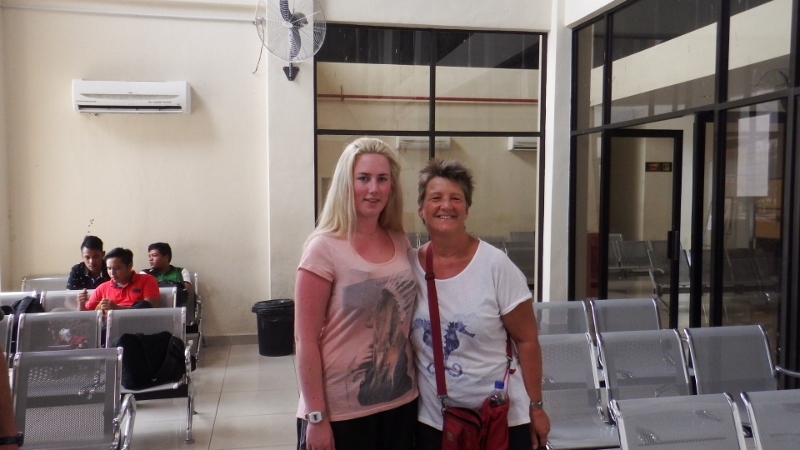 Ananda were there with Tricky, Jane and little Milly on board so it was good to catch up with them. They had discovered a really good and cheap Indian in the village so the next day we all went there for lunch. It was certainly a good choice. Tuesday 20th Ananda left and Bill and I spent the next couple of days doing general maintenance and cleaning including several walks to the village with jerry cans for more diesel. We are burning so much diesel with all this motoring. 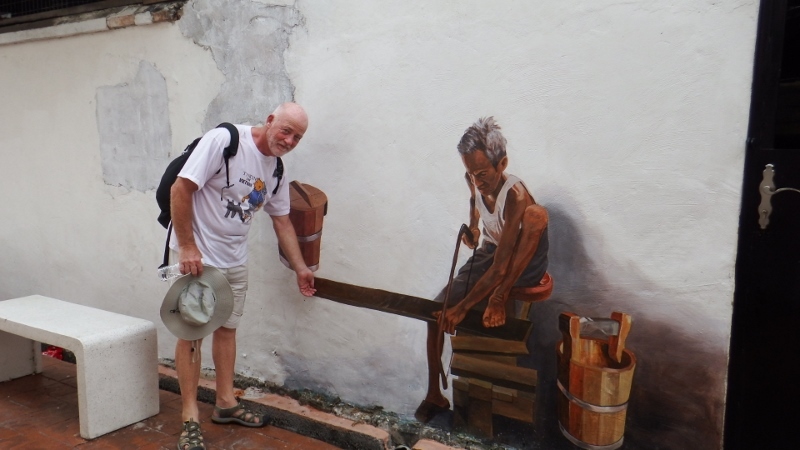 Thursday 22nd we got up early and packed a bag for a little land trip to Melaka. It took 4 buses and about 4 hours door to door. We considered hiring a car but the buses are cheap here. After checking into our hotel, the Swiss Heritage hotel, we went exploring. 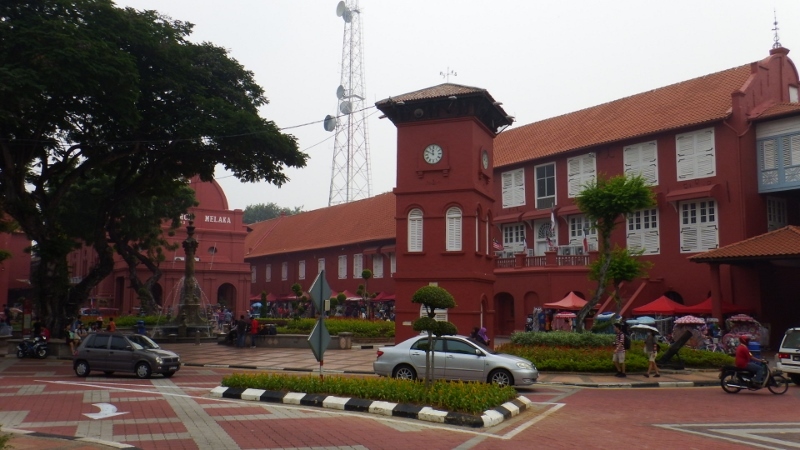 Melaka was designated a UNESCO World Heritage site in 2008 and was once one of the greatest trading posts in South east Asia. 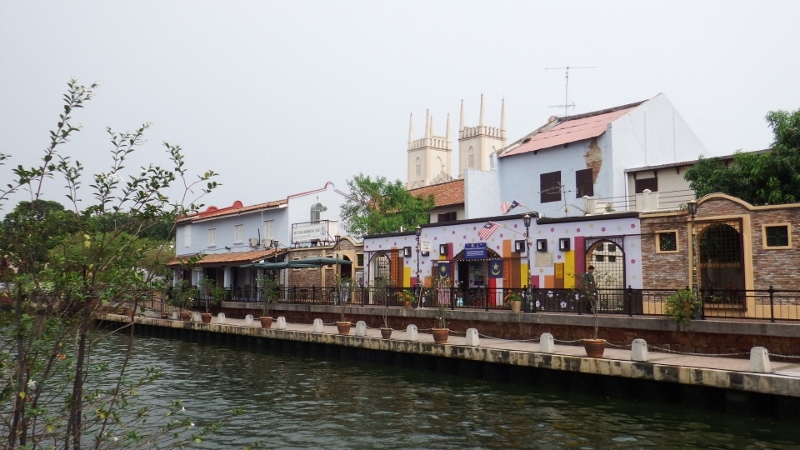 Up to the 14th century Melaka was a simple fishing village. 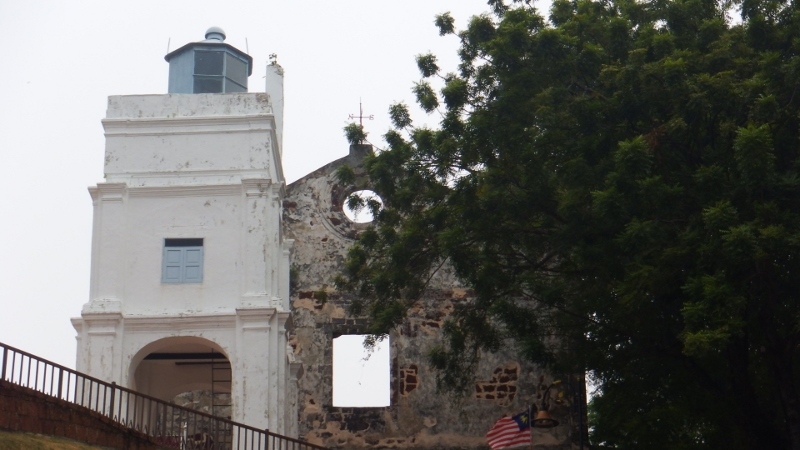 Halfway between China and India and with easy access to the Spice islands of Indonesia, Melaka attracted merchants from all over the east and became the favoured port. 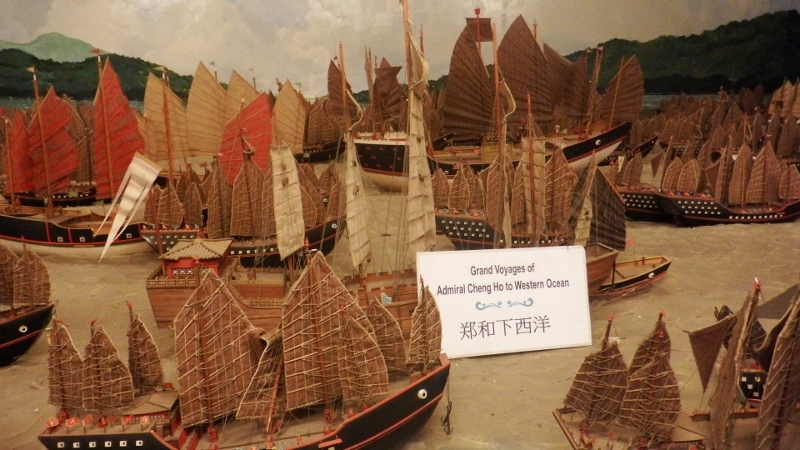 In 1405 Chinese Muslim Admiral Cheng Ho arrived bearing gifts from the ming emperor followed by Chinese settlers. 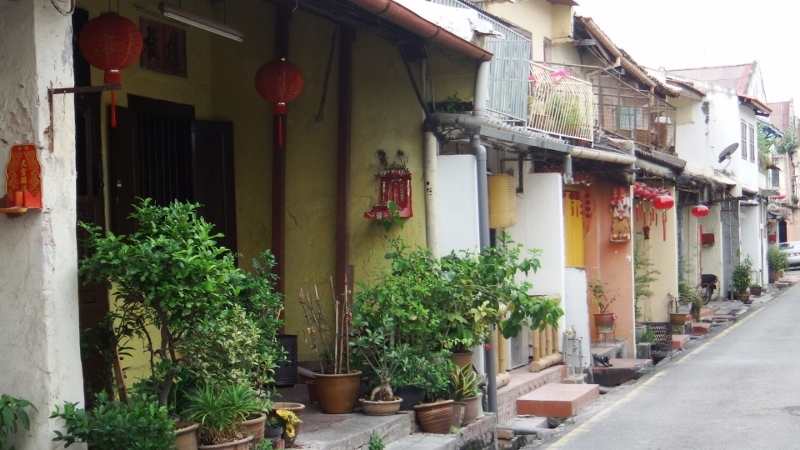 The historic Chinese quarter is charming. Some of the historic buildings have been transformed into shops selling tourist tat but there are still many enchanting little buildings. The waterfront was very attractive. You can just see one of the few catholic churchs in Malaysia peeping over the top of the buildings. There is some unusual art work around the town. These street art pictures were intriguing. 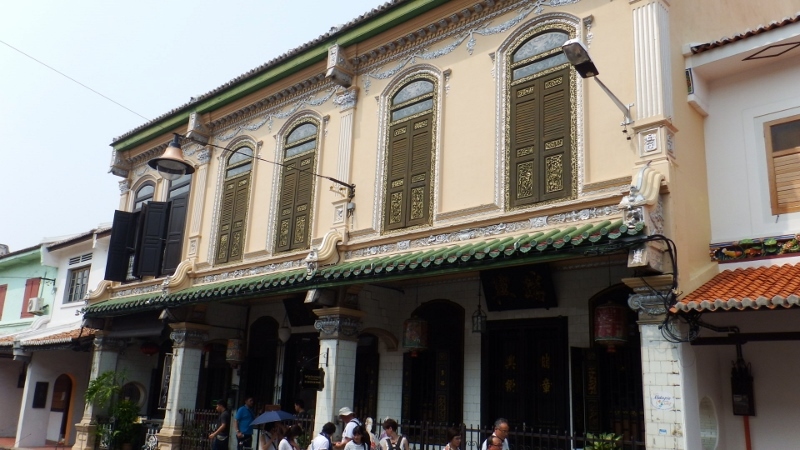 In amongst Chinatown was the Cheng Ho cultural museum which told the story of Admiral Cheng Ho’s arrival and his adventurous voyages – seemed an apt museum for us to be looking at! It was very interesting and we spent several hours in there. There were some unusual exhibits. Not sure what he was doing in there. 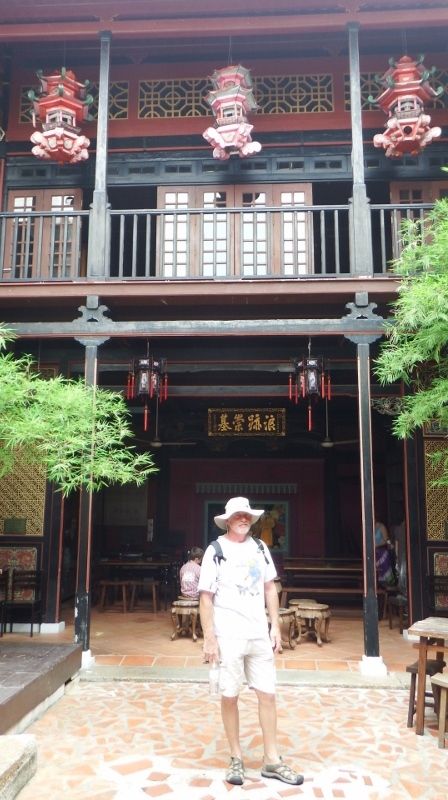 Many of the traditional longhouses have been restored. Traditionally houses were narrow in the front because the owners paid less tax. They were built back quite a way so the central courtyard allowed light in. Also they were mostly back to back so everything had to be brought to the front to be disposed of including slop buckets. Must of been very smelly. This restored property was now a restaurant. 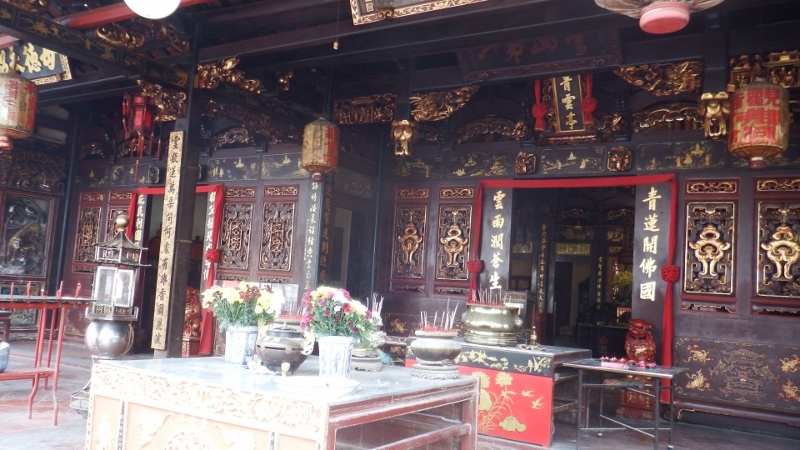 and reminded us of the wonderful temples in China. The next morning we visited the maritime museum which was fairly uninspiring although they did have a few interesting exhibits. It’s spread over three areas culminating in the an old warship. 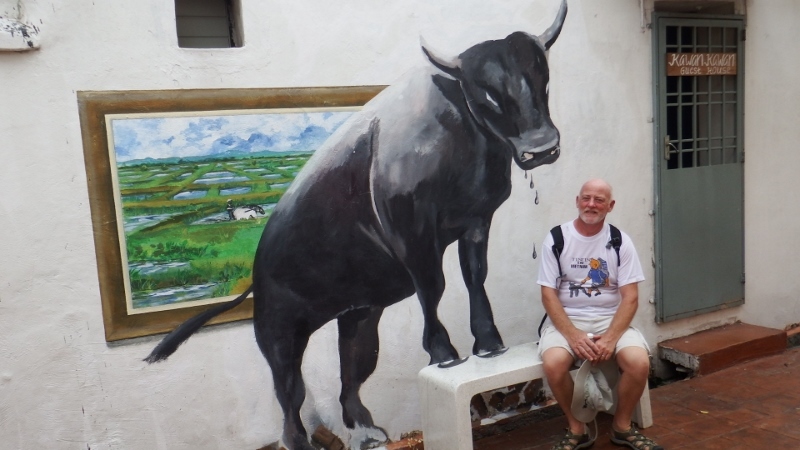 Melaka became a powerful trading state under the Chinese but at the beginning of the 16th century the Portuguese came seeking some of the wealth and forcibly took the city in 1511. 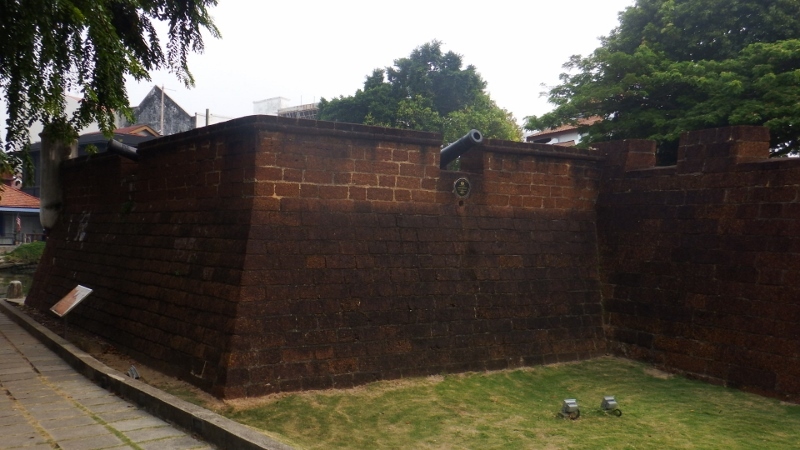 The Portuguese built a fortress on the opposite side of the river but many of the merchants from Arabia and India wouldn’t deal with the Portuguese and the port fell into decline. 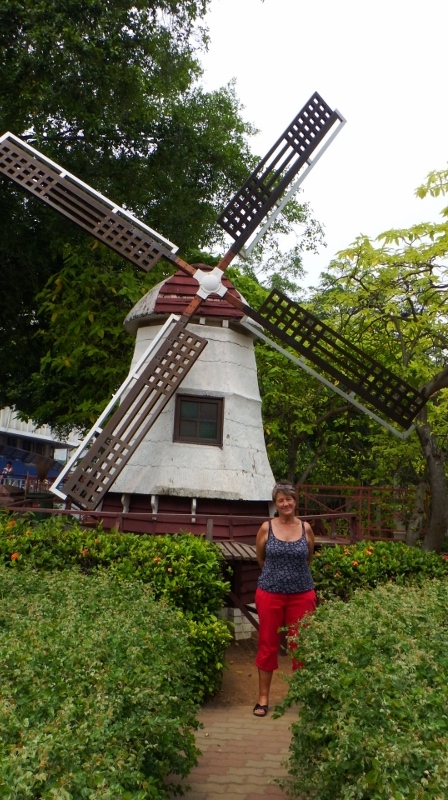 The Dutch took over in 1641 after an eight-month siege and ruled Melaka for 150 years. 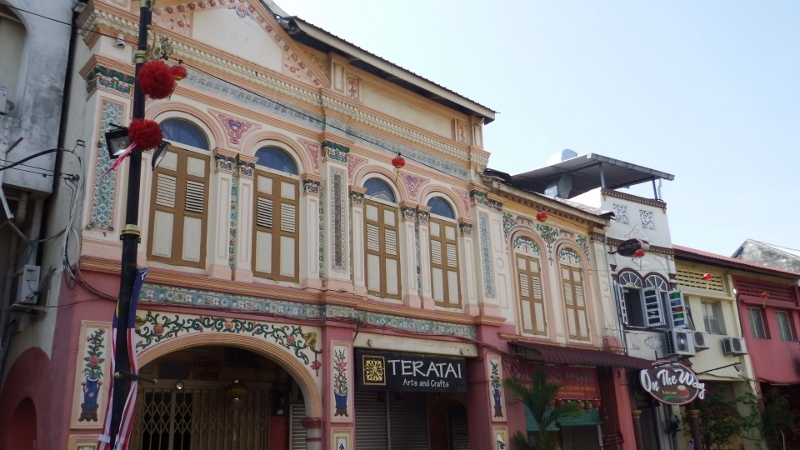 Melaka became the centre for Peninsular trade again. 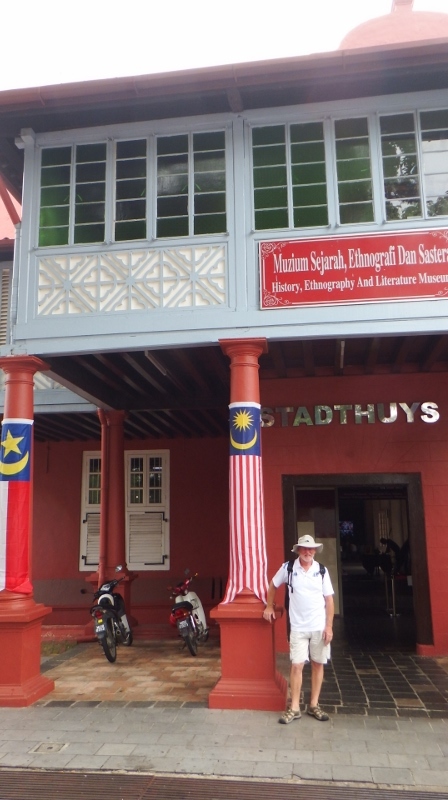 Soon after they captured Melaka the Dutch built the Stadthuys, Melaka’s unmistakable landmark. It’s believed to be the oldest Dutch building in the east and is a reproduction of the former Stadhuis (town hall) of the Fresian town of Hoorn in the Netherlands that we have also visited. Within the complex is the former Governor’s house and the complex is now a nicely presented museum. There are several churches in the area. 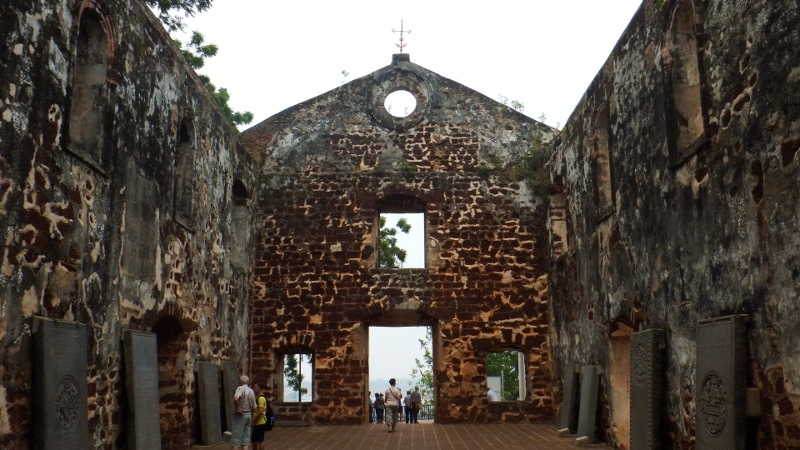 On the hill above the Stadhuys complex is St Paul’s church originally built by a Portuguese captain in 1521. The church offers great views apparently but with the smog we couldn’t see very far. When the Dutch completed their own church St Paul’s fell into disuse. It’s had various uses since then including a lighthouse and a store for gunpowder but it’s been in ruins for more than 150 years. 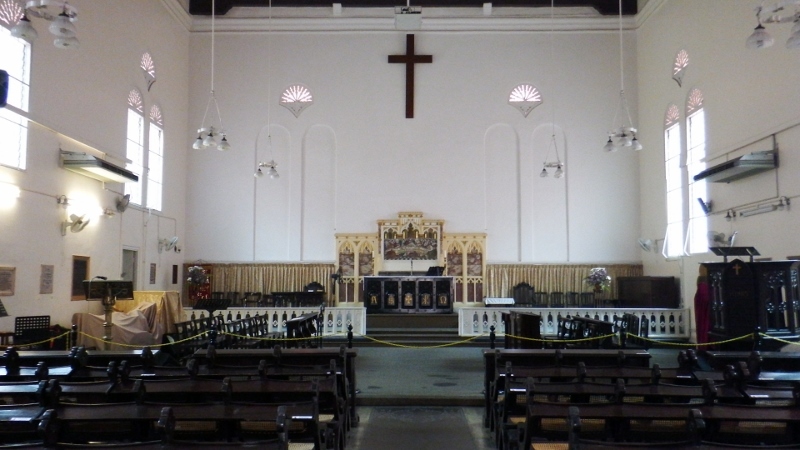 The Dutch completed their own Christ church in 1763 at the base of the hill beside the Stadhuys. It was very traditional inside, something you rarely see in Malaysia. I always like these signposts. According to the sign it’s over 10,000kms to London. The area was very crowded but we managed to get some nice photos. 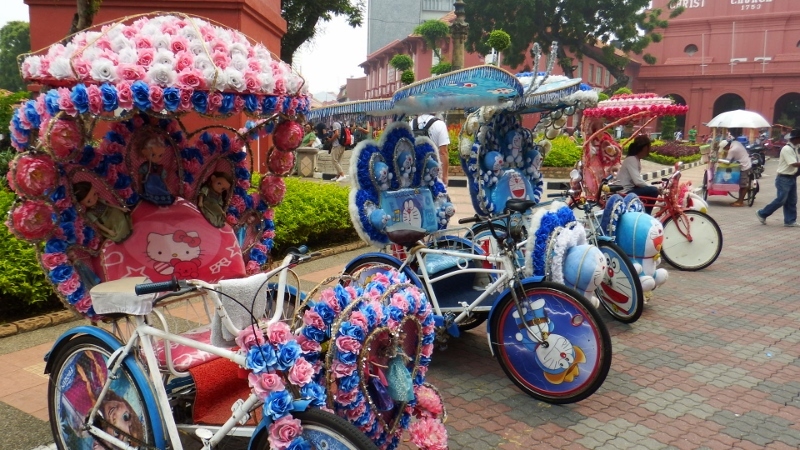 To get around the town there were lots of rickshaws offering rides but they seem to be in competition with each other to see can offer the most gaudy decorations. They also had the most irritating musical accompaniment. Needless to say we turned down their offers of rides. 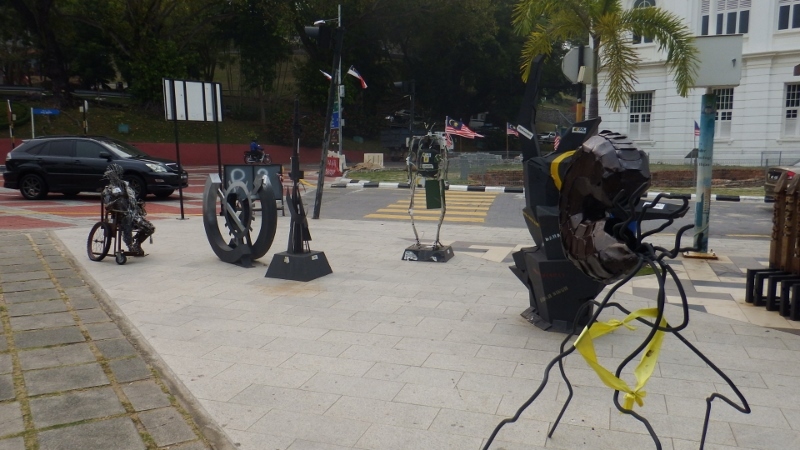 There was more street sculpture on this side of the river. When the French occupied Holland in 1795, the British assumed administration of the Dutch colonies. 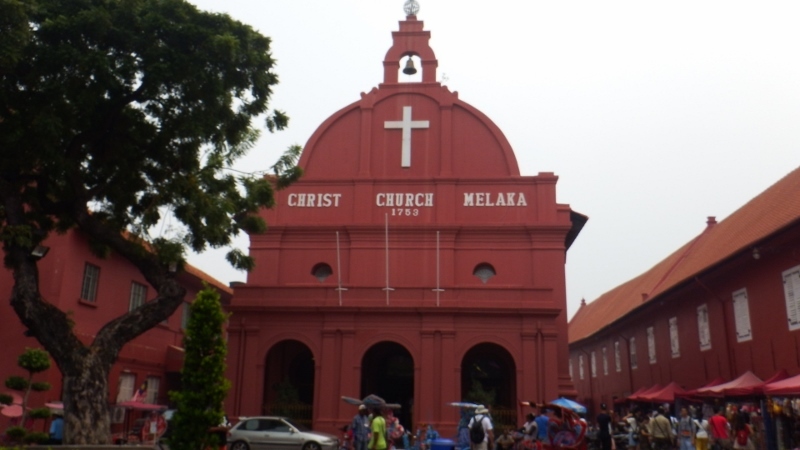 In 1824 Melaka was permanently ceded to the British. 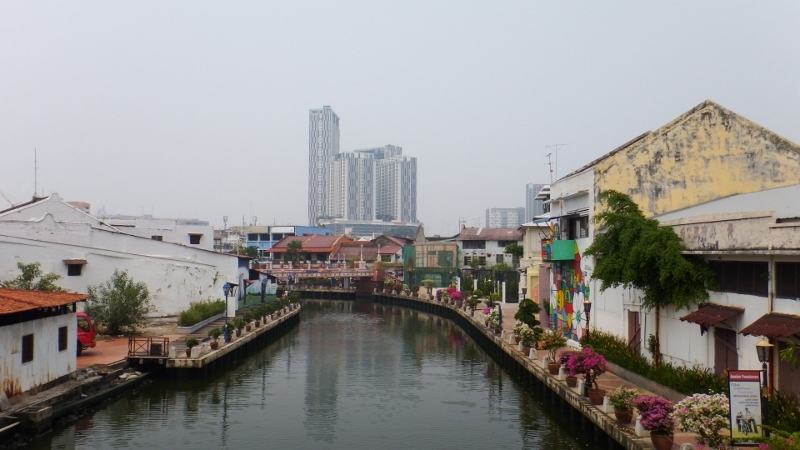 Melaka together with the islands of Penang and Singapore formed the Straits settlements and came under British rule with the rest of Malaysia until the Japanese took over during the second world war. Malaysia gained their independence in 1957. After lunch we visited the Baba-Nonya museum. 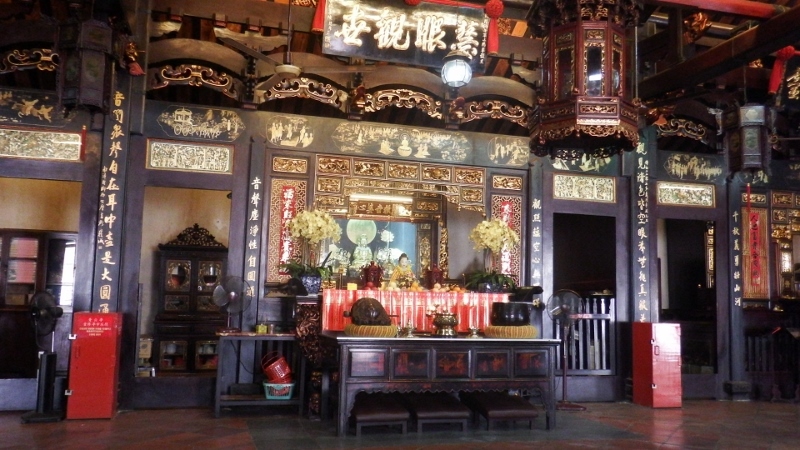 It is a traditional Peranakan longhouse. Actually it’s three houses that were joined together to form one home in the 19th century. 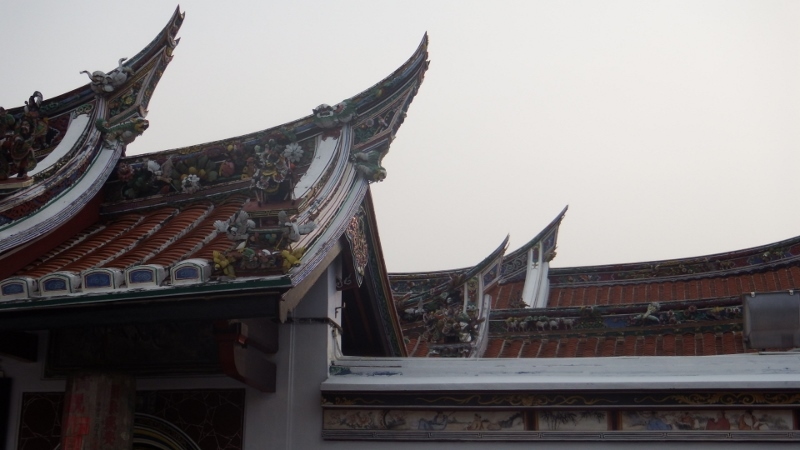 When the Chinese people arrived in Melaka and started to marry local girls their children were known as Straitsborn Chinese. The baba was the man and the nonya was the woman. 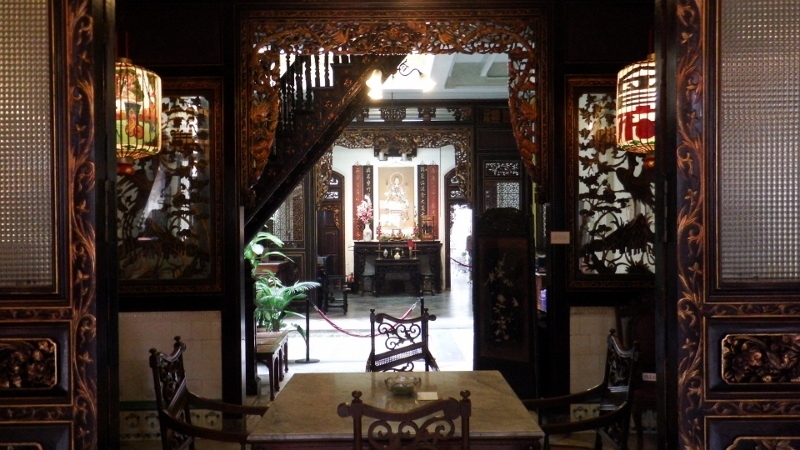 The owners of this house are sixth generation Straitsborn Chinese. Touring this house takes you back to the time when women his behind elaborate partitions when guests dropped by. 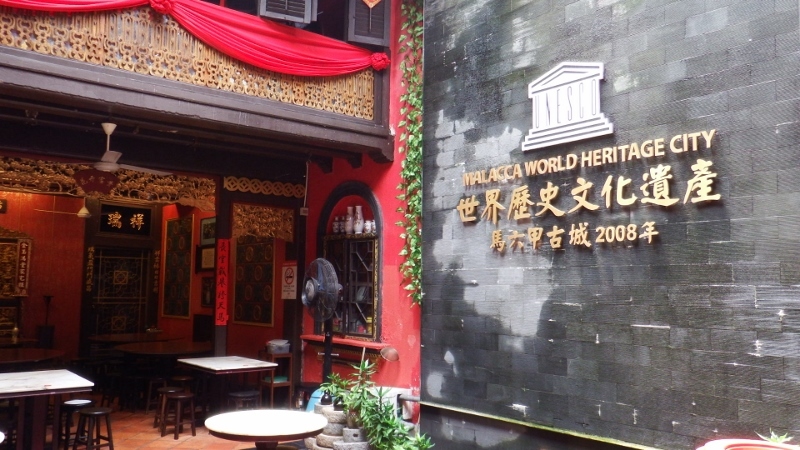 The captivating museum is arranged to look like a typical residence. The tour guide was very informative and told many stories of life within the house over the years. I found it fascinating and really enjoyed the tour, would recommend it. 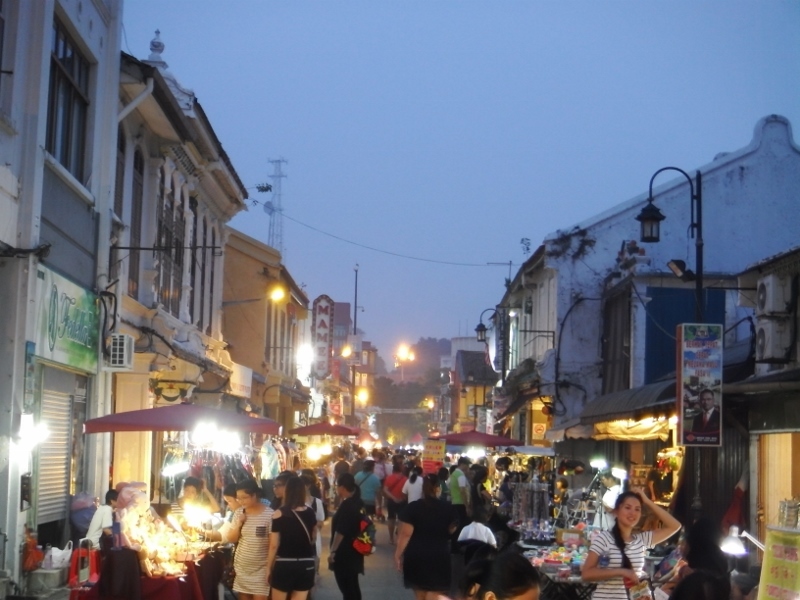 We had timed our trip to coincide with a Friday evening as there’s a night market on Friday, saturday and Sunday evenings all along Jonker’s walk. There were lots of stalls selling trinkets and food hawkers selling a wide variety of food. With the road closed to traffic for the night we spent a lovely evening wandering along the street. 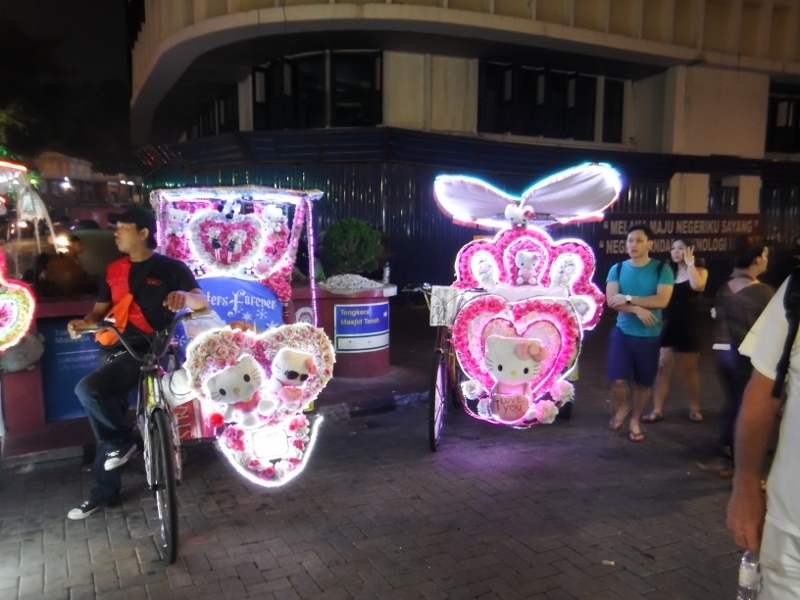 As it got dark the rickshaws added a new dimension – they were lit up with flashing and twirling lights! The next morning we checked out of our hotel and made our way back to the boat on the 4 buses again. Sounds a bit laborious but it was fun. 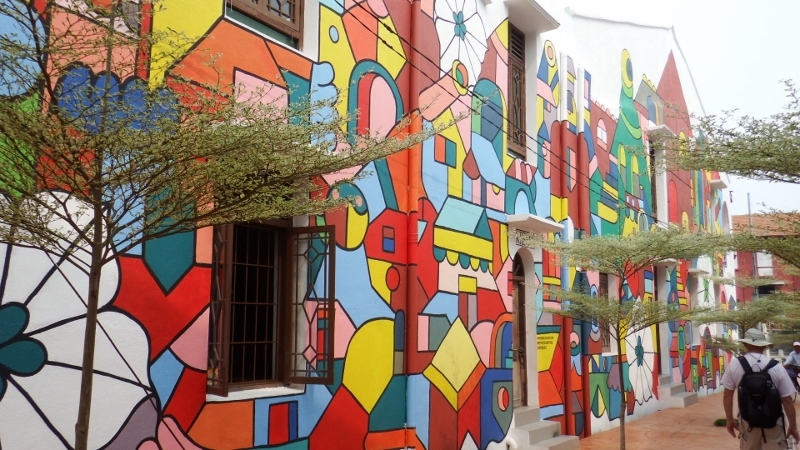 Melaka is definitely worth a visit. We spent another couple of days in Admiral marina because Bill wanted to buy new batteries for Camomile. The new ones we bought just before we left were getting very tired and wouldn’t get us home. It would be cheaper to buy them in Malaysia than to wait until we get to South Africa. 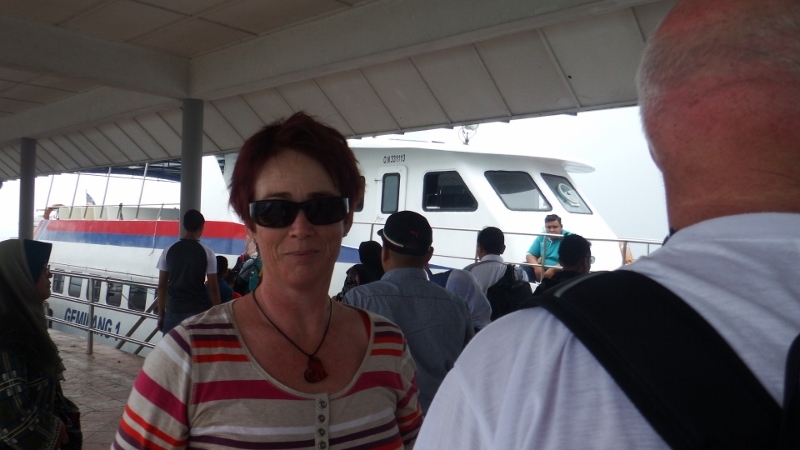 So we had to wait for the company to send us an invoice so we could go to the bank to pay the money and have them delivered to Pangkor marina – our next destination. 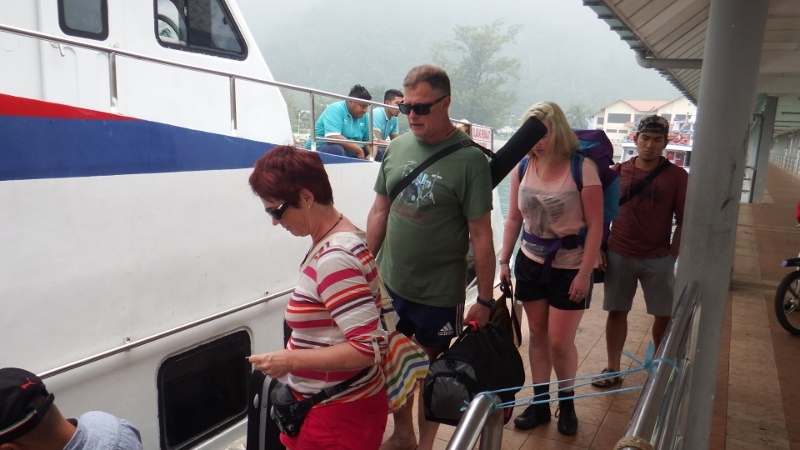 The next morning we continued our journey to Pangkor arriving very late on the 29th. 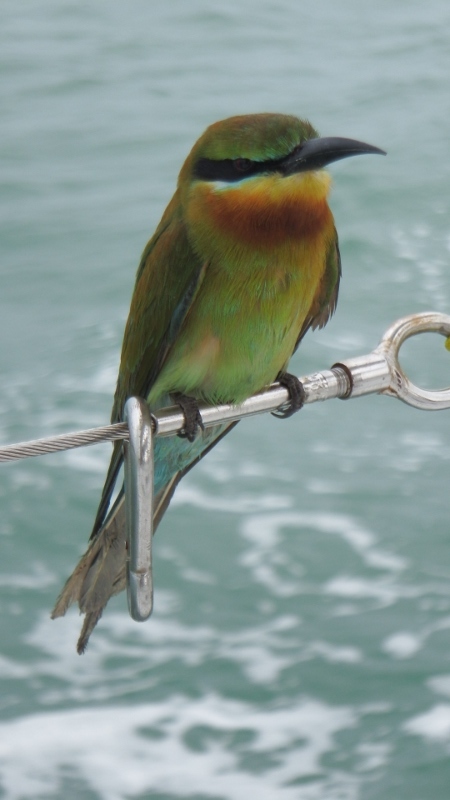 This beautiful bird hitched a lift all the way to Pangkor. I think it’s a blue tailed bee catcher. 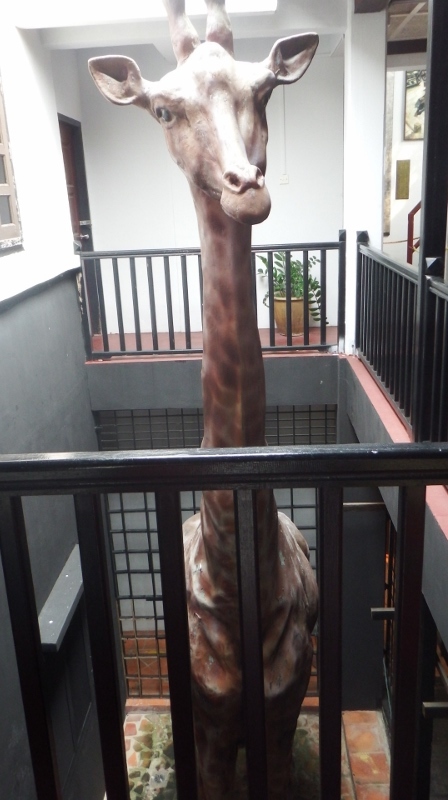 It was quite extraordinary remaining perched on the guide rails not bothering about us moving around in the slightest. That night he puffed up his feathers and went to sleep. The next morning he was still there, even allowing us to stroke him. At one point we thought he was dead but after about 9am he just shock himself and flew away. Bill wasn’t too happy with the ‘deposits’ he had left behind. Finally got a decent signal to update the website. 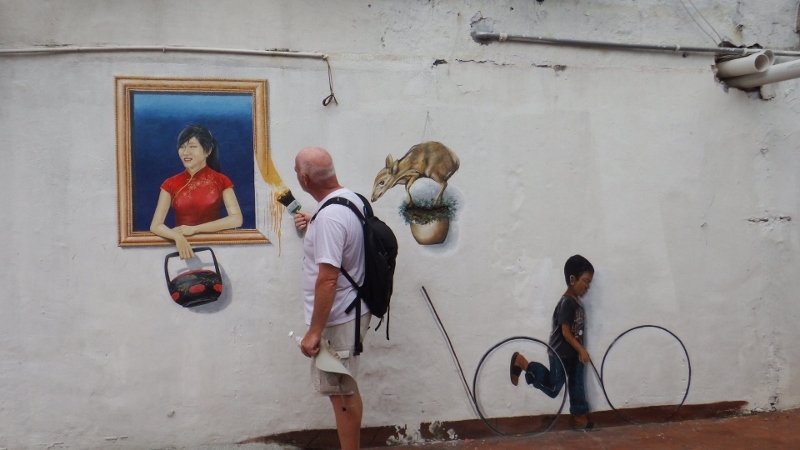 I’m still writing the Chinese story but first a quick blog on what we’ve been up to. 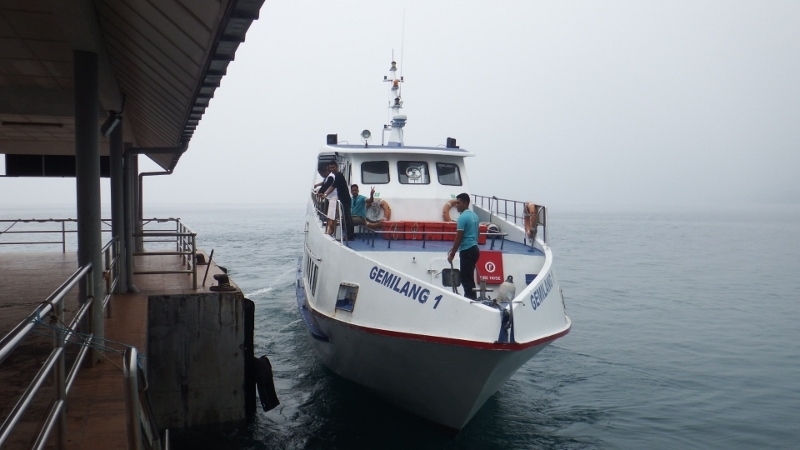 After arriving back in Terengganu on 20th September. 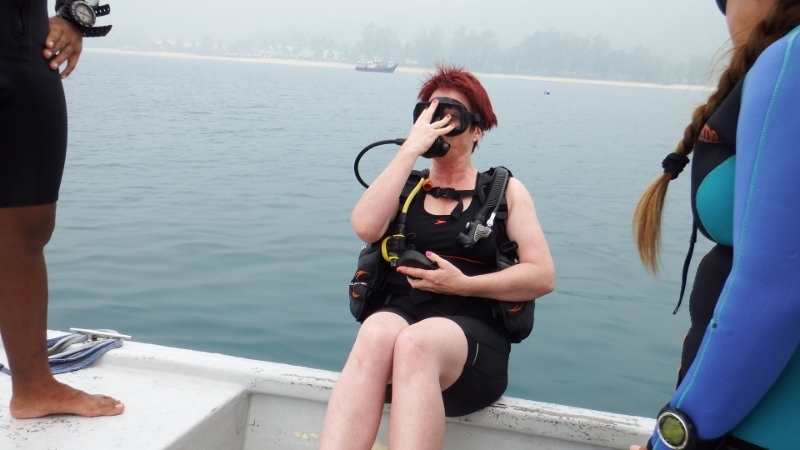 We spent a couple of days unpacking, shopping, washing and fueling before leaving on 22nd. 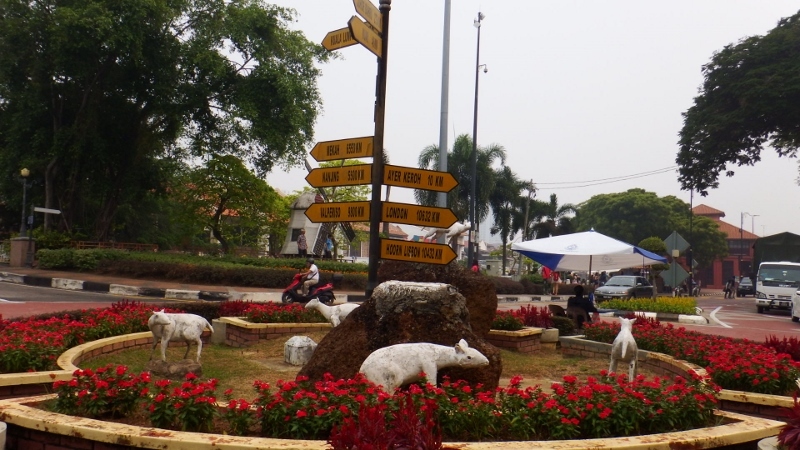 Terengganu was a nice town with a good supermarket and also a very nice Chinatown area. The buildings have been nicely restored. 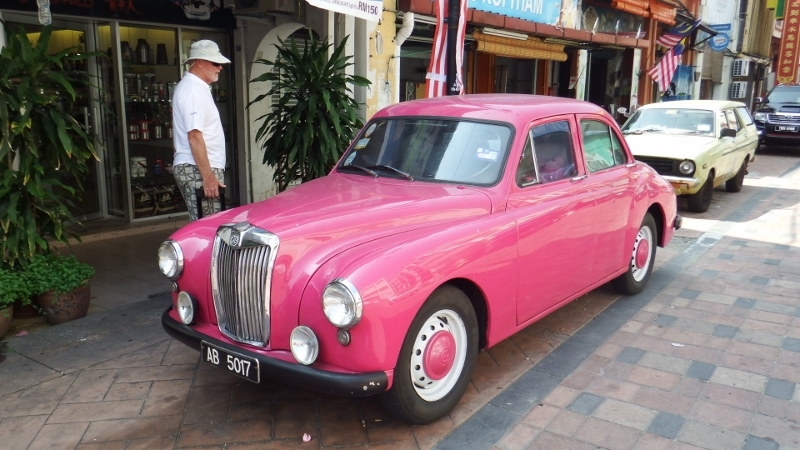 How about this classic car? Isn’t it pretty? 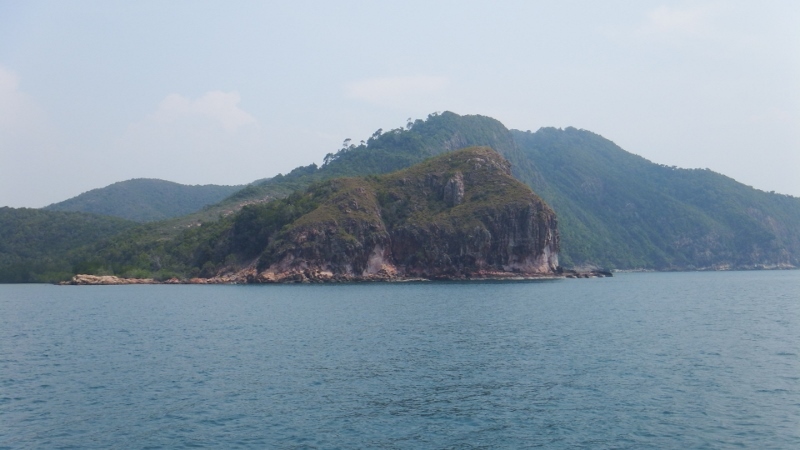 After spending a couple of days at Kapas, one of our favourite islands, we did an overnighter down to Tioman island arriving at the little marina Saturday lunchtime. Bill’s sister Kate, her new fiancee Mark and our niece Daisy were due to arrive the next day. 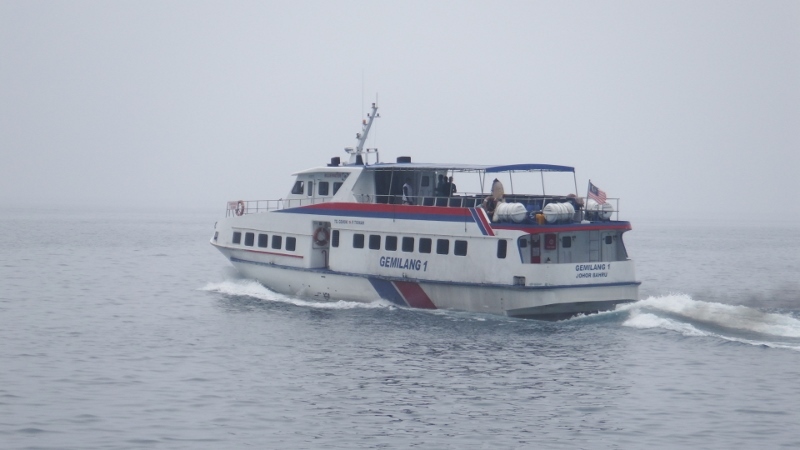 Sadly the Indonesian fires were causing a bad haze and the beautiful views of the island were no where to be seen. After a difficult journey they finally arrived in the evening all hot and sweaty. We decided to go straight out for a meal because it was pointless having a shower and going out and getting all sweaty again. They were grateful for our air-conditioning unit. 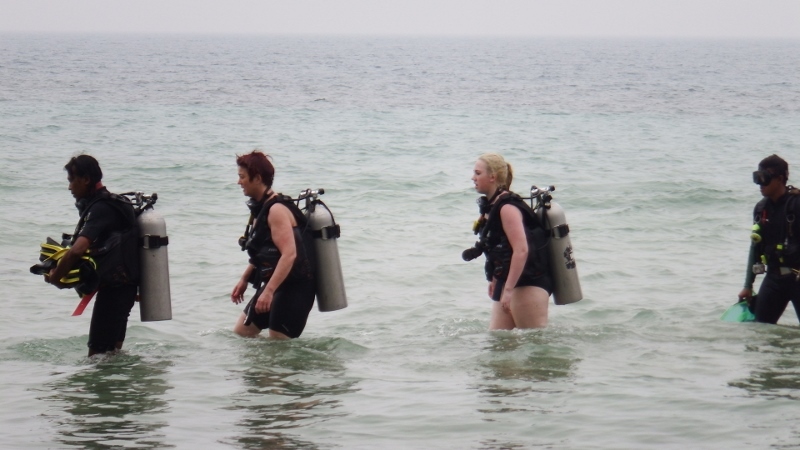 Considering Daisy hadn’t dived before she did very well. After a little bite to eat (not to much) Yn sketched out a chart of where we were going. 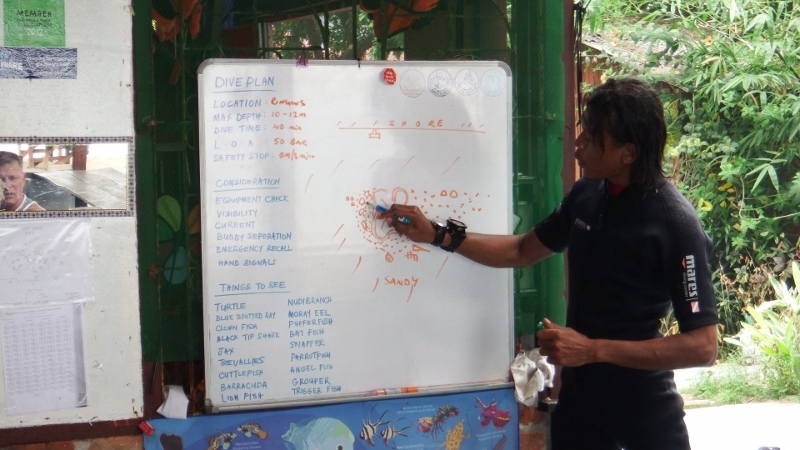 There was a diving plan for Bill, Kate and Daisy while Mark and I were going to snorkel. All the equipment was loaded into the boat and off we went. As they didn’t have any thing to do that afternoon two of the other dive masters decided to join us so the three of them had a dive master each and it wasn’t an expensive day either. 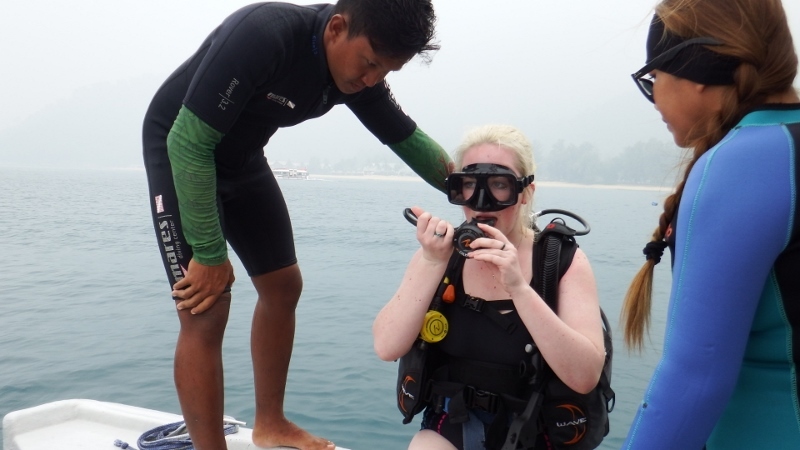 Bill has his own kit but Kate and Daisy hired their’s so with the skills test, the dive and the 5 of us in the boat it came to about £75 – bargain. 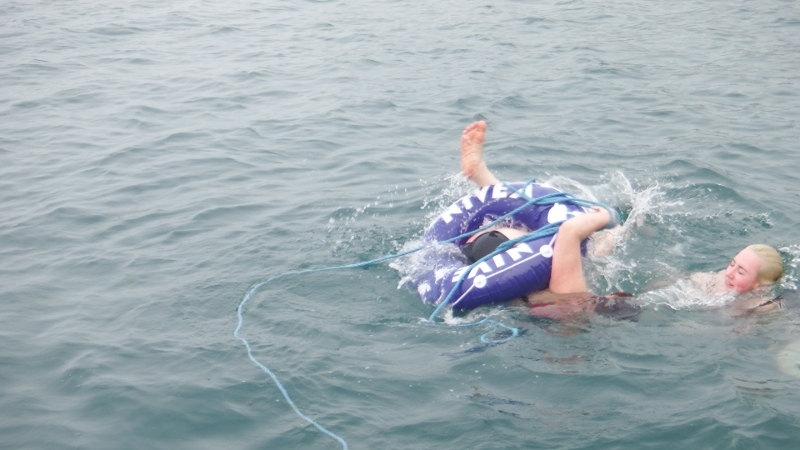 Daisy was very brave and went in first performing a perfect back roll out of the boat first time. 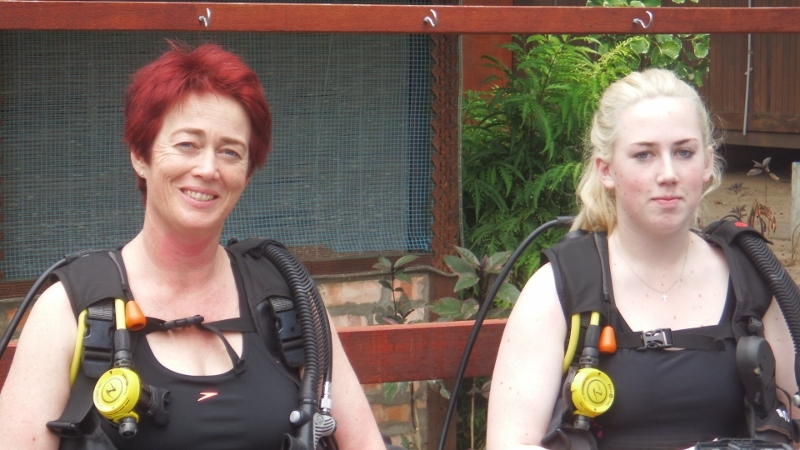 Followed by Kate who also did a perfect back roll. 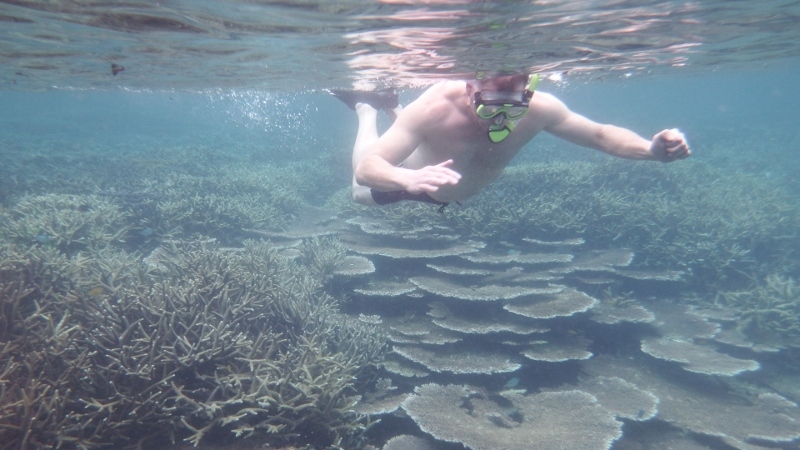 They all disappeared below the water down to about 6 metres so not too deep but deep enough to enjoy the fish. 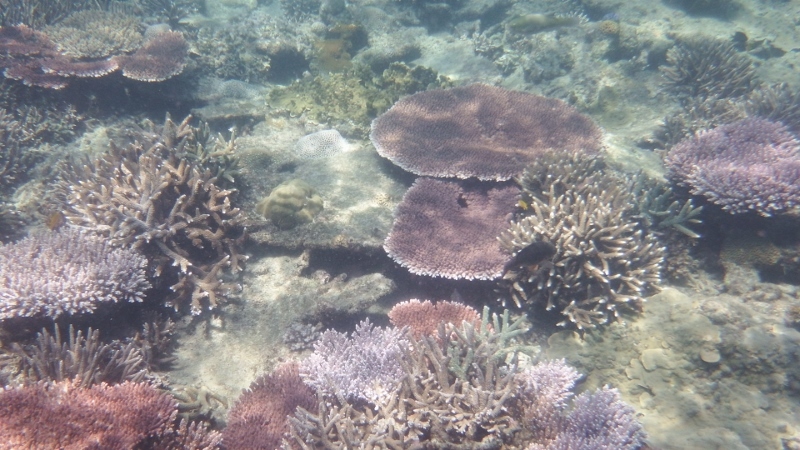 Meanwhile Mark and I were taken to the shallower side of the island so we could snorkel. 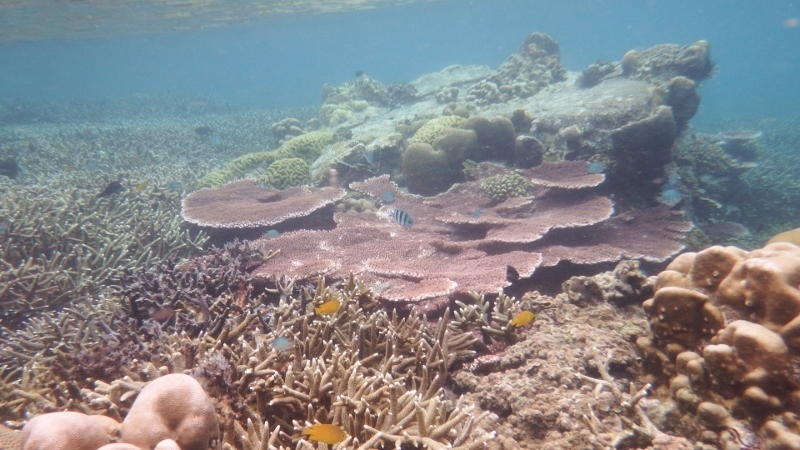 Mark was amazed by the fish and the coral, he said it was like being in an aquarium. 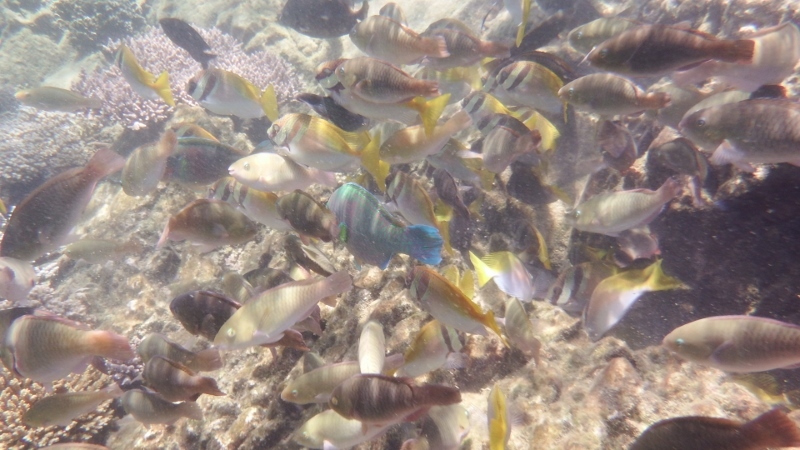 Even without the sun the colours were amazing and so many fish. Everyone had a great time. The boat even took us back to the marina to save us having to walk back in our wet swimmers. In a way it was good that the sun was blotted out because they would have all burnt to a frazzle. As soon as the anchor went down they were in the water. 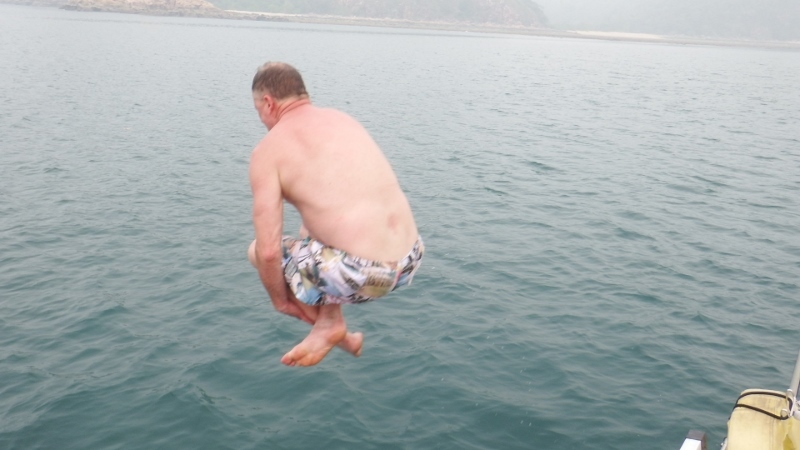 Although we didn’t have the sun it was still far hotter than they were used to and getting in the water was a good way to cool down even with a water temperature of 26C! I spent the afternoon preparing food for a bbq which Bill and Mark were in charge of while it was cooking along with quite a few beers. Normally we could have sat and watched the stars but the smog scuppered that idea. 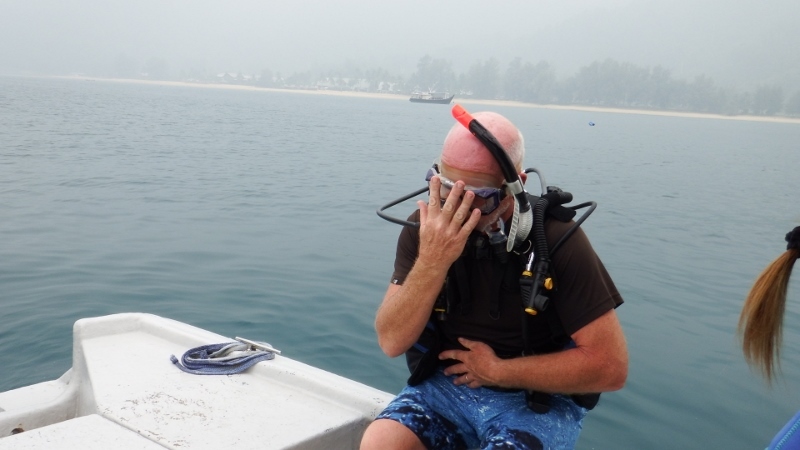 The disadvantage of coming out of the marina was that the air conditioning unit had to go off and even when it got dark it was still very hot. 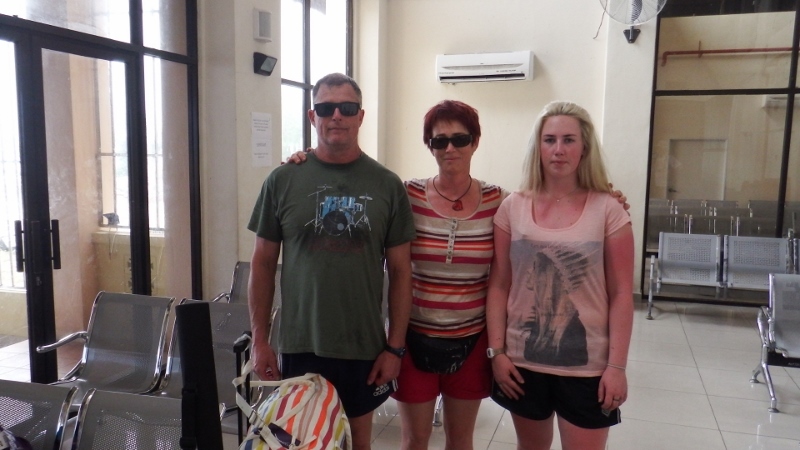 Poor Kate and Mark didn’t have a very good night’s sleep as they had arrived from a New Zealand winter into 32C without time to adjust to the temperature so the next day it was decided to head back to the marina and get the air conditioning back on. Before we left Bill took them for a little explore in the dinghy. There’s a little island in the channel where someone has built a hut but sadly the beach is covered with plastic washed in from the sea. 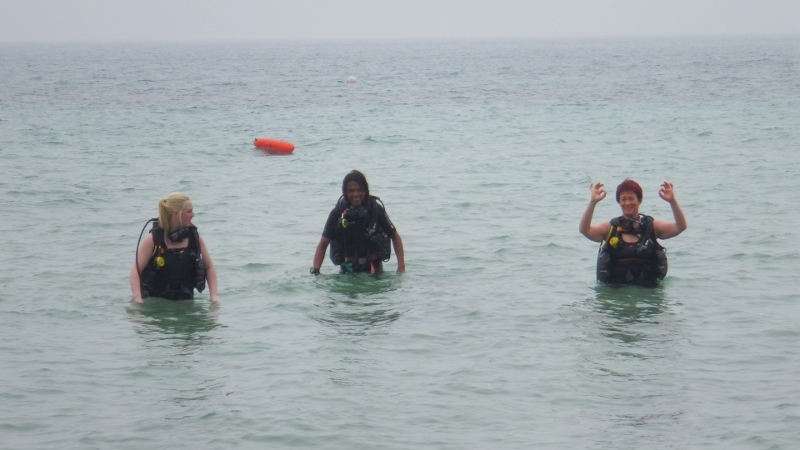 They went onto the beach where there’s a nice little bay for snorkeling, although not as good as the island the dive team took us to, it was still fun for them exploring the crevices and rock pools. 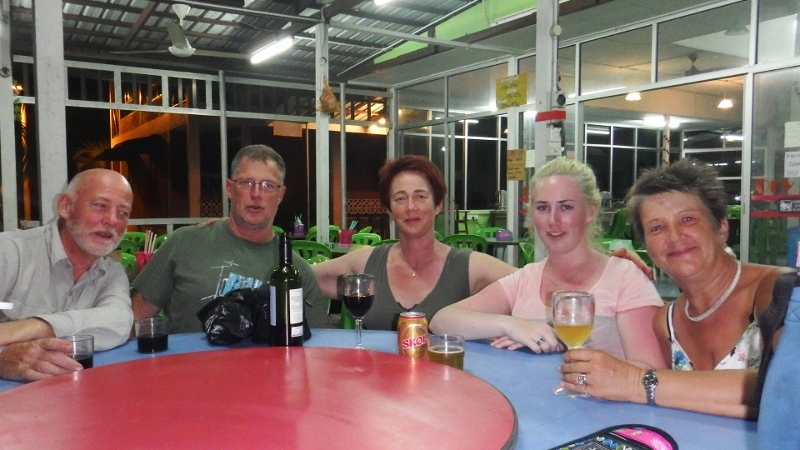 Once back in the marina we headed out into the village for a meal ashore on our last evening. Daisy and I went looking for monkeys before dinner and although it was already getting dark there were quite a few sitting in the trees above the road. Kate and Daisy went for a better look at them in the morning. All too soon their visit was over and it was back to the little ferry port so they could catch the ferry back to the mainland then take the coach back to Singapore for their onward journey. They fitted quite a bit into their 4 days but it had gone very quickly. Photos were taken in different combinations. When did you get so tall Daisy? The ferry arrived and it was time for final goodbyes. Goodbye Kate it was great to see you and to meet Mark. It was nice getting to know you Daisy.